set yourself up for the future, and maybe even make a few extra dollars while you’re at it. However, real estate investment doesn’t come without its fair share of hazards. 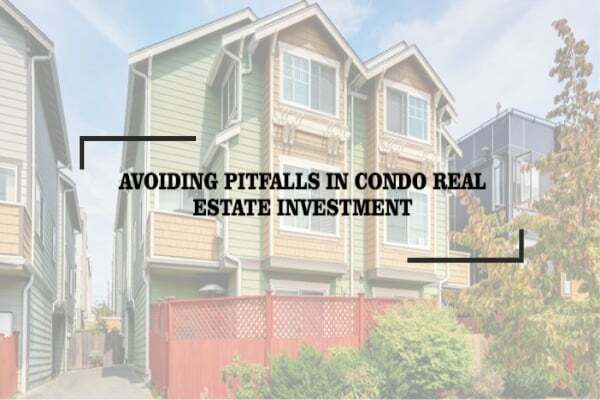 That’s why we’ve brought in John Mayberry, Realtor® – real estate investment expert and founder of the Calgary Home Boys – to share some wisdom with us about what steps to take to find that dream investment property, and how to avoid running into trouble along the way. Cash flow. The whole point of investing in real estate is to hopefully come out with a net positive gain, so your cash flow should always be top of mind when making any sort of decision –including rent. Mayberry recommends finding a property that allows the rent to cover the property’s mortgage, associated condo fees, and a little bit extra for maintenance. Also, be sure you’re in a position to cover things in case of vacancies, or you could find yourself in a world of potential trouble if the rental market takes a dive. Condo documents, have they been reviewed by a professional; are there any special assessments looming in the next few years; is it clear what you, the owner and what the board / condo corporation is responsible for? Building issues, check when the property was built – was it during the boom, when construction may have been rushed and/or sloppy? The reserve fund study, is it healthy and up-to-date? The condo board itself, you’re investing in both a home and a business with a condo – is the board functional? The surrounding neighbourhood, what part of town is the property in, and will this help or hurt your chances on the rental market? That’s a lot to consider, but you’ll be doing yourself a favour by taking the time to look into these details! Consider maintenance. The costs associated with maintenance have done-in many a property investor. In addition to his advice when it comes to cash flow, Mayberry also recommends being sure to factor in any initial maintenance costs when considering a purchase. Will you be able to foot the bill for any up-front repair fees and still keep afloat for those first few months while you hunt down a tenant? Definitely something to think about. Be wary of “foreclosures.” Oftentimes, people will come across a foreclosure, and you can almost see the cartoon dollar signs start spinning around in their eyeballs. Mayberry recommends caution when it comes to these “deals,” however. If something seems too good to be true, it usually is – take the time, do the research, and more often than not, you’ll be thankful to walk away having dodged a bullet. Be smart. As an investor, take the time to make smart decisions. Mayberry advises giving extra consideration to the management team at the head of the property, as well as the building itself. Is the building healthy? Is the board functional? Do resales do well there? What sort of state are the bylaws in? Does the budget look sound? Taking time to mull over these details can be a lifesaver later on. Build a solid team. Don’t go in alone. Arm yourself with a team of experts knowledgeable in both real estate and investing who can work with both agents and mortgage brokers to help structure your finances as an investor. Be sure to also take advantage of home inspectors, condo doc review services, and lawyers – these folks will act as checks and balances to help keep your investment on the up-and-up. Budget accordingly. Run the numbers. Run them again. Then, run them once more, just for good measure. It’s not just the mortgage and condo fees you need to consider – Mayberry stresses how important it is to be set up for any vacancies, maintenance issues, or other troubles you might run into, in order to avoid a few tough months putting you into serious financial jeopardy. As his last bit of advice, Mayberry reminds us that taking the time to educate yourself and aligning with the proper team is the best guarantor of success. A good group of experts won’t be as concerned with chasing a paycheque as they will be about providing value, education, and keeping your best interests at heart. Anyone can sell you an investment property – but if you can find a team that provides real, honest-to-goodness value, you’ll have locked down something truly special. Have more questions about investment properties? Interested in building your team of experts? Reach out to us at Catalyst Condo Management – we’ll be happy to set you down the proper path towards real estate investment success, and will work with you to ensure you’re taking all the right steps along the way!